In a cell, structures exceeding 20 nm require energy-dependent motility to travel through the cytosol. Therefore viruses take advantage of molecular motors to move newly assembled viral progeny to the plasma membrane to facilitate their spread into surrounding cells . Microtubule-dependent outward transport involves motor proteins like kinesin . The taking of the cytoskeleton one two three: how viruses utilize the cytoskeleton during egress. Coupling viruses to dynein and kinesin-1. Herpes virus 1 (HSV-1) . 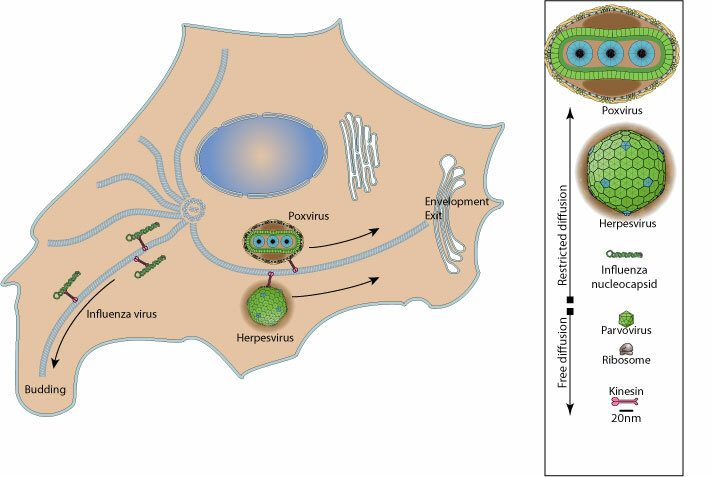 Formation of orthopoxvirus cytoplasmic A-type inclusion bodies and embedding of virions are dynamic processes requiring microtubules. electron tomography of herpes simplex virus during axonal transport and secondary envelopment in primary neurons.